The Akshaya Kumar Maitreya Heritage Museum incorporating Raja Rajaram Museum Collection was established in the University of North Bengal, Siliguri in February 1965. It functions as a regional museum and is one of the few University Museums in India. The main objects of the Museum are to collect, preserve and study archaeological relics lying scattered in the six Districts of North Bengal and Sub-Himalayan Region. Airport :Bagdogra Airport, 7 Km. This museum has on display a wide collection of wooden and stone sculptures, coins, terracottas, manuscripts, old books, dokra , folk art and paintings on wooden plates (rath fragments) along with the personal collections of Rabindranath Tagore, P C Roy, Jagadish Bose, Jawaharlal Nehru and other eminent persons, and objects and documents of Indian independence struggle. Timings : 14:00 to 21:00 hrs, on all days except Wednesdays and 2nd and 4th Tuesdays. Nearest Railway Station : A one-hour train journey on a Tarakeswar local from Howrah station, to Haripal. From there, it’s a 30-minute Trekker ride to Rajbalhat. The interest and zeal of the local public led to the establishment of Tamluk museum and research centre in 1975 with the primary objective of preserving the rich cultural heritage of Tamluk and its adjacent regions.The museum houses prehistoric implements collected from various parts of Medinipur district and has gained fame in the realm of terracotta art from the Sunga, Kushana, post Gupta and Pala periods. Development of Indian coinage has been displayed starting from silver punch marked coins, cast copper coins, coins of Muslim rulers and up to modern times. Another interesting object on display is a Roman amphora, indicating the trade contacts of this region with the Roman empire. The museum also has a collection of Patachitras - colourful scroll painting depicting puranic and mythical stories. There is no entry fee. The Museum remains closed on Friday. Asutosh Museum of Indian Art, the first public museum in any university in India, was established in 1937. The Museum, acclaimed as one of the richest university museums, and a major public museum in India, is located in the Centenary Building of the University of Calcutta, at its original campus in College Street. Named after Sir Asutosh Mookerjee, the great educationist, who introduced the study of Indology including Indian art and archaeology at the university level, this Museum stands for preservation, presentation and study of objects of Indian art and antiquity particularly of eastern India. The museum has a unique collection of the folk and rural art of the country, of Bengal terracotta through the ages, and of some of the finest creations of the eastern Indian school of sculptures and bronzes. There are also interesting collections of patachitras, or painted scrolls, painted book covers, Kalighat paintings, playing cards, palm leaf manuscripts, ritual objects, toys and dolls. The textiles include embroidered Kanthas, the patchwork and quilting textile technique, and saris from Baluchar with their quaint figurative designs, consisting of sculptures, paintings, folk-art objects, textiles, terracottas, etc. From a humble beginning with only 5 objects, the museum has swelled to contain more than 25,000 items of extraordinary variety, providing a wide panorama of cultural endeavours of the people throughout the ages. Bagnan Ananda Niketan Kirtishala was opened on 14th January, 1962 in a backward area of the district of Howrah with the objective of introducing the cultural and historical treasures of Bengal to the common folk. The collection includes objects of folk arts and crafts, manuscript and coins of different eras reflecting the ethnic culture of the people of Bengal. The museum had developed owing to the untiring and indomitable efforts of Sri Tarapada Santra and the guidance of Sri Amal Kumar Ganguly. Tarapada Santra’s zeal and remarkable capacity for the collection of objects from different parts of West Bengal formed the original collection together with a small number of antiquities. Bangiya Sahita Parishad Chitrasala on Upper Circular Road was established 1910. A symbol of the Bengal Renaissance in the 19th century, it houses relics of the rich cultural legacy and traditional heritage of Bengal. Collections include valuable mediaeval stone and metal sculptures, manuscripts, letters of famous Bengali authors, gold and silver coins, and art and craft work of Bengal. Closed : Thursdays and public holidays. The Acharya Jogesh Chandra Purakriti Bhawan aka Bishnupur museum was started by a group of people in 1951 and is now under the control of the Directorate of Archaeology and Museums, Ministry of Information and Culture, Govt. of West Bengal. It is a significant attempt to preserve and archive the history and cultural heritage of Bishnupur and its surrounding areas. This museum preserves the traditions of terracotta and other indigenous art forms in Bankura, including dhokra craft, patachitras and Dashabotar cards. The iconic Baluchari silk saris with scenes from Hindu mythology woven on them are on display, some dating back to 150 years ago. The museum offers a fascinating collection of prehistoric objects from the Mesolithic and Paleolithic era, tools, metal ornaments, as well as coins and other artefacts from the ancient days of Bishnupur, starting from the Gupta kings to the Pal kingdom. A section of the Purakriti Bhawan is dedicated to the musical culture of Bishnupur Gharana and has many instruments and photographs displayed. Also showcased are rare photographs of Sree Sarada Devi, wife of Sri Rama Krishna Paramhansa who was born in this district. The museum now attracts a lot of international tourists and researchers. The Central Museum located at the premises of the Anthropological Survey of India, Kolkata is an ethnographic and anthropological museum that has on view objects and specimens on crafts, musical instruments, economic artifacts, dress and ornaments as well as objects related to religious activities from tribal and folk communities. The museum lays emphasis on depiction of bio-cultural heritage of people of the concerned zone. The palace at Cooch Behar built by Maharaja Nripendra Narayan in 1887 AD was taken over by the Archaeological Survey of India in 1982 for protection and preservation. The present museum was established in 2002 with the antiquities and objects collected by the Kolkata circle of the Archaeological Survey of India as well as the state government. The exhibits are arranged in seven galleries. Gallery No. 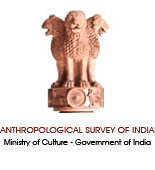 3 & 4 are the ethnic galleries organized with the help of Anthropological Survey of India wherein life styles of different communities in Koch Bihar region with their daily use, objects of occupations, masks, musical instruments etc. has been displayed. Ethnographic Museum was established in 1955 It was built by the Cultural Research Institute, Govt. of West Bengal. Objects on view include hunting tools and equipment, fishing gears, dresses and ornaments, utensils, furniture, spinning and weaving aids and also objects relating to art, religion and `magic`. Stores photograph and tape-records of folk music depicting lifestyle of the tribes of this state. The Gurusaday Museum is a treasure trove of Folk and Tribal Arts and Crafts of undivided Bengal as well as India. The museum was founded by Bengal Bratachari Society in 1961 with 2325 items which had been personally collected between 1929 - 1939 by Shri Gurusaday Dutt, I. C. S. (1882-1941), while he was the District Collector in the remote parts of the then Bengal. Since 1984, Gurusaday Dutt Folk Art Society manages the Museum .Presently, it has a collection of over 3300 exhibits of folk arts and crafts, showcasing the vitality of rural life , its social traditions, religious beliefs, motifs and cultural influences especially in undivided Bengal. The Indian Museum the earliest and the largest multipurpose Museum in the Asia-Pacific region of the world was founded in 1814 in Kolkata. Sir William Jones the renowned Oriental scholar founded the Asiatic Society in 1784 in Kolkata and subsequently, the Oriental Museum of the Asiatic Society, under the Honorary Curatorship of Dr Nathanial Wallich was established on February 2, 1814 at the Asiatic Society on 1 Park Street. The museum was shifted to the present building at Chowringhee Road in April 1878. The Indian Museum popularly known as Jadughar or Ajabghar has six sections: Art, Archaeology, Anthropology, Geology, Zoology, and Industry (Economic Botany). Opens on all days except Mondays and recognized holidays. The Kerala Folklore Museum is the only architectural museum in Kerala with the essence of the life and culture of the common man over the past 1000 years. It is also a cultural hub which features ‘Face Art Gallery’- for Art & Antiques; live performances of traditional art forms & cultural activities; a ‘Spice Art Café’ to experience the real culinary taste of traditional Kerala and a souvenir shop. This is a treasure trove of stone, wood and bronze sculptures, ancient terracotta, Stone Age objects, jewellery, paintings, oil lamps, musical instruments, tribal and folk art, wood works, utensils, masks and traditional art forms etc. There are around 4000 artifacts on display. This unique cultural project aims to provide art education to the students and to help provide visual and academic knowledge to the art lovers, researchers and travellers from all over the world. Malda Museum is an archaeological museum under the West Bengal Directorate of Archaeology, situated on the Bandh Road of Malda Town. The museum, renovated and revamped recently, showcases the archaeological, anthropological, and historical heritage of the region. The museum has a number of fine specimens of sculptures, figurines, calligraphic inscription tablets, terracotta plaques and other artifacts that represent more than 1500 years of history and heritage. The Museum of Folk and Tribal Art, an undiscovered jewel tucked away in the urban estate in Gurgaon houses one of the most distinctive collections of Indian folk, tribal and neglected art. The museum is a labour of love started by Mr. K.C. Aryan noted art historian, painter, sculptor and writer. This priceless legacy is lovingly tended by his offspring. The museum deserves serious recognition and appreciation in it`s tireless effort to preserve and showcase some of India`s most priceless folk and tribal artefacts. At present the Museum of Folk and Tribal Art is located at Mr KC Aryan`s personal residence, one hour`s drive from New Delhi, close to IGI Airport. Efforts are on to construct a new Museum building in New Delhi.